Epsom Salt for Gout: Can This Natural Remedy Help Gout Symptoms? Can Epsom Salt Help Gout Symptoms? You’re already aware that treating gout starts with prescription medications. What you may not be aware of there are a few lifestyle changes and natural remedies for gout that may help – one being Epsom salt for gout. Read on to learn more about how Epsom salts, how Epsom salts may help, and more. Epsom salt, magnesium sulfate, is a naturally occurring compound named after the English town it originates from. Not to be confused with Dead Sea salts, Epsom salt is distilled from a saline-rich spring in the town of Epsom in England, producing a chemical composed of magnesium, sulfur, and oxygen. The salt’s ability to help with these conditions are mostly based on claims by regular folks who have used it. However, there’s not that many scientific evidence to back these up. The theory is that the magnesium and sulfate easily penetrate the body’s largest organ, the skin, and draws out toxins responsible for many kinds of aches and pains. Let’s take a more in-depth look at each compound found in Epsom salt. Magnesium is one of the six essential minerals needed by the body to function optimally. We need it in large amounts, but often, we’re unable to meet this requirement through our diet. That’s why getting magnesium through Epsom salt is so beneficial. Once inside the body, it helps regulate over 325 enzymes that play a critical role in the body’s essential functions including muscle control, cholesterol regulation, toxin elimination, energy production, brain/nervous system communication, and cell membrane health. Studies show that people who take the daily recommended dose of magnesium reduce their risk for diabetes, migraine, and depression. Relating this to gout, those who are likely to suffer from this condition also have diabetes. If you want to lower your risk for both, you may want to consider upping your magnesium intake. Sulfate: What Does It Do? Most of Epsom salt’s benefits are associated with its magnesium content, but sulfur is just as important too. It regulates the activity of enzymes needed by your body to function properly. Sulfur also helps with the detoxification process. It supports the sulfation pathway where the body’s toxins are broken down. Those who have autism, Alzheimer’s disease, Parkinson’s, and rheumatoid arthritis are linked to having a deficiency in this pathway. Epsom salt is easily accessible and can be found in most drugstores. It’s also sold in most grocery and health food stores. Due to Epsom salt being so cheap and widely available, many people don’t hesitate to try this home remedy in an attempt to alleviate the symptoms of certain conditions. But what about gout? Let’s take a look at how Epsom salt can help. Does Epsom Salt for Gout Help? Yes, Epsom salt does help people living with gout. Many experienced gout sufferers swear by it. The salt gets easily absorbed through the skin, and being that it’s very alkaline, it dissolves the uric acid crystals that cause the painful flare. The best thing about Epsom salt is the type of contact it requires. As you may know very well, even the slightest touch can cause the most excruciating pain. With Epsom salt, you only need to soak the joint in water. No pressure needed. 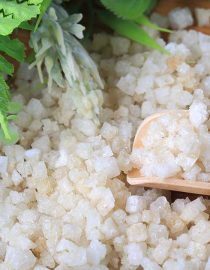 Again, there are no studies to substantiate Epsom salts’ benefit for gout but many home remedy DIY-ers continually use it for its positive effects. Often, medication is not enough to manage the condition that’s why people opt to try this home remedy. It also acts as an immediate pain reliever for unexpected gout attacks. Epsom salt provides almost immediate relief from a gout attack. Just soak the affected joint in a basin filled with warm (not hot) water that’s mixed with half a cup of Epsom salt and do this for at least 15 minutes. The heat helps to open up your pores making it easy for the salt to penetrate through the skin. If the joint is located in a difficult position like your elbows or knees, you can do an Epsom salt bath instead. Add two cups of Epsom salt to the bath and soak for 20 minutes. You may also apply a hot compress to the affected area. Soak the cloth first in warm water mixed with Epsom salt before applying the hot compress. To keep the compress in place, wrap the cloth around the affected joint. Even if you’re not suffering from a gout attack, you can still enjoy an Epsom salt bath for preventative and overall health purposes. You can even make a whole spa event out of it by adding drops of your favorite essential oils. Other people add baking soda or apple cider vinegar to their Epsom salt bath to maximize its alkalizing effects. Don’t be afraid to experiment with different remedies and stick to what works for you. Some people ingest Epsom salt for its laxative effect. However, Epsom is not like table salt in which it can be consumed by mouth. Therefore, is no benefit in ingesting Epsom salt for gout. Pregnant women should avoid Epsom salt soaks or baths as the magnesium sulfate can affect the baby. If you’re a diabetic and you have open wounds, avoid soaking it in Epsom salt water as this can lead to an infection. Use a moisturizer after the bath as the Epsom salt can dry your skin. Avoid Epsom salt baths if you are severely dehydrated. If you have a cardiovascular disease, talk to your doctor first about doing Epsom salt baths. The general rule is to use one-part Epsom salt to two parts water. However, if you experience any negative side effects from this, consider reducing the amount you use.